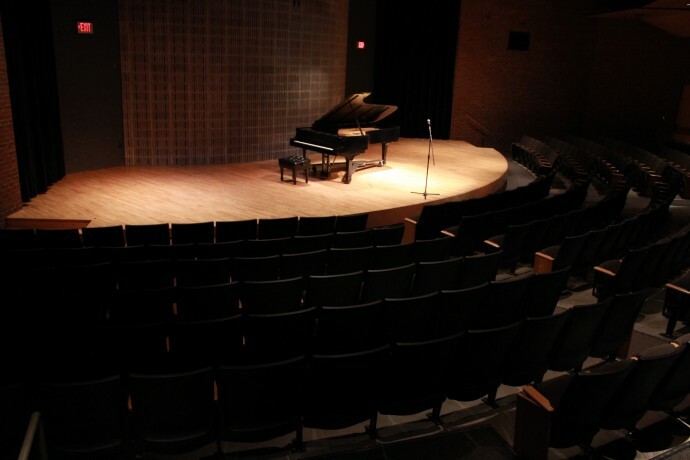 School of the Arts’ Ensemble Theatre is an acoustic gem, designed for chamber ensemble, choral, and musical presentations. It is also ideal for small plays, one-person shows, improv and comedy troupes, spoken word, and multidisciplinary works. It is an extremely intimate space where performers can establish instant rapport with the audience. The three-quarter thrust stage is 16 feet at its deepest point and does not easily accommodate backstage crossovers. There is limited wing space to accommodate temporary set storage and quick costume changes. The theatre has projection, sound and lighting systems which may be accessed upon request. Dressing rooms and restrooms are located within close proximity to the space. The SOTA Ensemble Theatre seats 225 and is handicapped accessible. Please Note: SOTA does charge a nominal technical fee for the Fringe performances we host. 225 seats arranged as Seating sectioned into 10 rows, very intimate, raked-style theatre seating. 30 or more instruments available. Isolation is available and two different washes (3 back and 3 front - warm and cool). Screen and projector available. 16 channel sound board, speakers are in the walls - handheld mics available. Excellent acoustics; theatre designed not to need mics. There are dressing/green rooms in close proximity to the stage. Please contact us for details on specifics.